Thought you couldn’t get slow-cooked flavor from the grill? When barbecue-braising, your grill performs like an oven: You just put your pot on the grill, cover, and let the meat simmer. After braising, add the flavor-packed glaze. 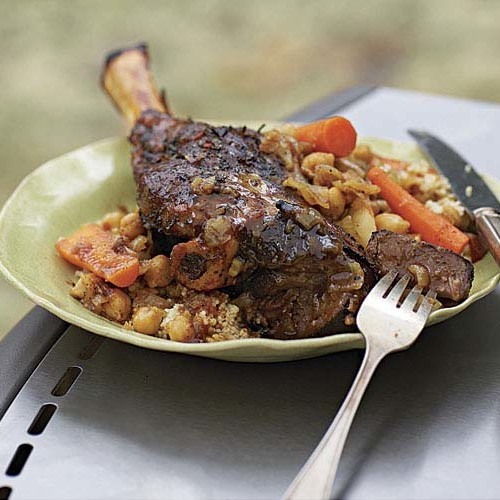 The result is delicious, saucy, fall-off-the-bone meat, perfect for summertime entertaining. In a small bowl, combine the chile powder, five-spice powder, brown sugar, 2 tsp. salt, and 1 tsp. pepper. Sprinkle generously all over the ribs. Cover and refrigerate for at least 2 hours but preferably overnight. Prepare a gas grill for direct grilling over medium-high heat. Grill the ribs until all sides are nicely browned, 1 to 2 minutes per side. Let cool briefly and then tie with a couple of loops of butcher’s twine. Prepare the grill for indirect grilling. Set an 8-quart heavy-duty pot over medium heat and when hot, add the oil. Add the onions and cook, stirring occasionally, until soft, about 5 minutes. Add the garlic and ginger and stir for 1 minute more. Pour in the chicken broth, 1/4 cup of the vinegar, 1 Tbs. of the brown sugar, the fish sauce, and the soy sauce. Add the star anise, bring to a boil, and then remove from the heat. Put the ribs in the pot and set the pot on the grill over the cool zone. Cover the pot, close the grill lid, and cook for 30 minutes. Check the ribs and rearrange so they remain submerged in the simmering liquid. Check the ribs again after 30 minutes and move them around if necessary. After another 30 minutes, check the ribs for tenderness. They should be fork-tender but not falling apart. If they’re not tender enough, continue to cook, checking every 15 minutes. Remove the ribs from the pot and set aside. Pour the liquid into a heatproof vessel, such as a Pyrex measuring cup, and let sit until the fat rises to the top. Skim off and discard the fat. Taste the liquid; if it’s too watery, return to the pot and boil over high heat until flavorful. Prepare the grill for direct grilling over medium-high heat. Pour 1 cup of the braising liquid into a small saucepan and stir in the remaining 2 Tbs. brown sugar and 2 tsp. rice vinegar. Over medium-high heat, reduce the liquid until it becomes syrupy, about 12 minutes—you’ll have about 1/3 cup. Brush the glaze over one side of each short rib and grill glazed side down until the glaze begins to bubble and lightly darken, 2 to 3 minutes. Brush another surface with the glaze and turn the ribs. Continue to brush and glaze, turning frequently, until all sides are nicely glazed. Transfer the ribs to a warm platter, drizzle with the remaining braising liquid, and garnish with the scallions and cilantro. Serve with rice noodles, steamed rice, or Spicy Slaw with Radiccio & Green Mango. To use a charcoal grill: First build a medium-high fire for searing: Ignite about 5 quarts of charcoal (80 to 100 briquettes), using either a chimney starter or an electric starter. When the charcoal is burning well, spread it out over the surface of the charcoal grate and put the cooking grate in place. Let the charcoal burn down until it’s coated with gray ash. To test the temperature, hold your hand about two inches above the cooking grate; when you can hold your hand there for 2 to 3 seconds (a medium-high fire), you’re ready to sear the short ribs. To glaze the ribs, rebuild a medium-high fire as you did for the searing step, and cook as directed in the recipe. 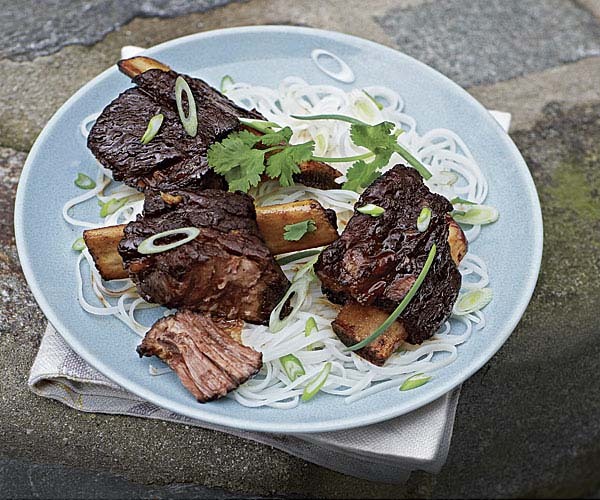 By far, the best short rib recipe yet. Made in the oven with a few modifications: Seared ribs on stovetop; bought braise to simmer after adding the ribs; braised at 300 for at least 2.5 hours, turning/checking every hour until done.Didn't make the glaze -- didn't have enough liquid; next time I'll add some alum foil to better seal the pot -- but strained and defatted the liquid, added a bit of brown sugar, and reheated the ribs, in foil, with the liquid. Pretty tasty but I think too much work for something just pretty good. I didn't cook my pot on the grill and did it on the stovetop. Used mint instead of cilantro which was nice. Probably won't do it again but did enjoy the dinner.